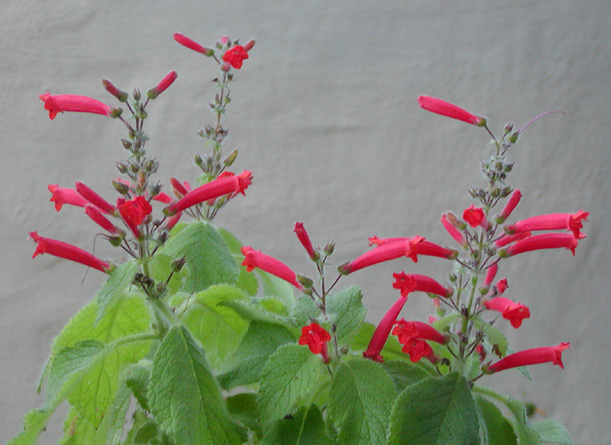 Sinningia araneosa has attractive hairy leaves and tubular red flowers. Plant grown outdoors in partial shade. Among the several recently discovered sinningia species, S. araneosa has drawn a lot of attention, due to the attractive hairiness of its leaves. Some plants stay compact, at least in pictures, while mine grow taller. The terminal inflorescence is something like that of S. valsuganensis. The first plants discovered were low-growing and very hairy. My plants grow at least a foot tall. Wild plants may be different. The external link below connects to a habitat picture showing a very different growth habit, with a short, compressed stem. It is therefore not impossible that the taller plants being grown as S. araneosa (including the ones in my yard) are a collection from a different locality. Alternatively, they may be what the native plants would look like if they got plenty of water and shelter from the direct sun. 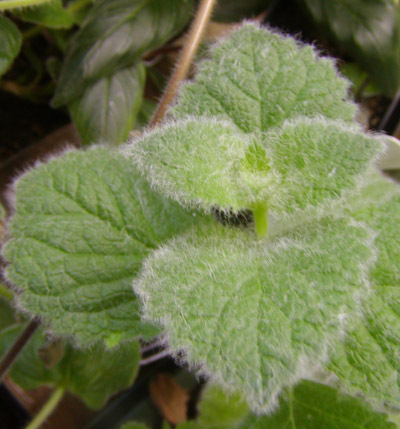 One seedling from my original plant is tall, but has much hairier foliage, as seen in this picture. Sinningia araneosa bears flowers on an extended axis. After several nodes of regular leaves, the axis elongates to bear 1-4 flowers per axil, on a very short peduncle (or none). In strong light, the stem is reddish-brown starting with the first flowering node, although in less light, the stem is green all the way up. Pedicel length is about 2 cm [less than 1 inch]. The top two lobes of the corolla extend to a kind of "pseudo-galea". The other three lobes flare at right angles to the tube. The anthers project beyond even the upper two lobes. 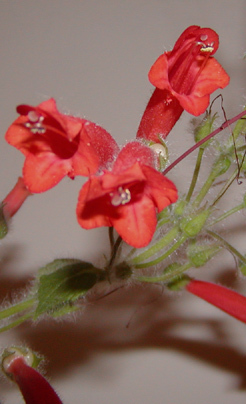 The combination of sticky, hairy leaves, red, tubular flowers, and exserted anthers mark this species as one of the Mamba Group. 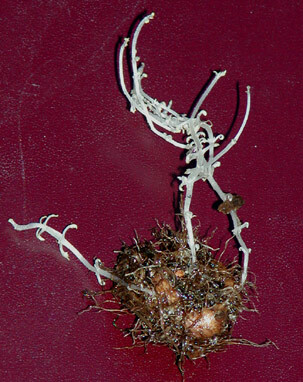 The tuber of S. araneosa is remarkably dead-looking when it is dormant. During the growing season, the tuber looks like a normal "bagel type". It can be placed deeper in the soil than those of many sinningias, in order to provide support for the stems, which aren't particularly sturdy (but not as flimsy as those of S. nordestina). This picture shows the result. These stems were heading up through the potting mix toward the light. It is easy to tell they are stems and not roots, first because there are real roots attached to the tubers, and second because there are small undeveloped leaves along the stems. From their whiteness, you can tell these shoots are tuber-powered, and not sun-powered. If and when they reached the light, then would be the time for making chlorophyll and taking energy from the sun. Habit Stems upright or at an angle. Dormancy Stems fully deciduous. Dormancy is obligate and lasts for several months. Inflorescence Extended axis, see discussion above. Flower Red, tubular, about 4 cm [1 1/2 inches] long, with two upper lobes projecting slightly and other three lobes flaring. Anthers are exserted. See a comparison with other sinningia flowers. Calyx Calyx lobes are joined only at base, so that when flower is open, the sepals clasp the flower individually like fingers. Corolla is more or less parallel to pedicel. Hardiness As a tuber, has survived 32 F (0 C). Over the winter of 2012-13, both my tubers were killed by overnight lows of 27 F. Thus protection from freezing temperatures is advisable. Propagation Tip cuttings of S. araneosa root very readily. S. araneosa sets seed easily, which germinates in abundance. So everybody should have one! Propagation From stem cuttings, which root easily for me. From seed too. Recommended? Definitely. This is one of my favorite sinningias. Mauro Peixoto's Brazilian Plants site has a page about this species, with an interesting picture of the plant in habitat. What is that white stuff? Snow? Limestone? Etymology: Latin araneosa ("full of cobwebs"), from aranea ("spider, cobweb").